Louis Tomlinson is many things: a talented musician, a phenomenal songwriter, a football fan, and the list goes on and on. He has a light and a magnetism about him that draws everyone into his orbit, but one trait that stands above the rest is his proclivity for giving back. If you speak to any of Louis' fans or simply anyone who knows him, Louis' involvement in charity is sure to come up. In 2011, One Direction's skyrocket to fame began, with their debut single releasing in September, their debut album releasing in November, and their first headlining tour beginning in December. And yet, despite his now busy schedule, Louis wasted no time using his new influence and celebrity to champion numerous charities, giving his all for those less fortunate than himself. "C’mon Mum, let's make someone happy today." In 2012, Louis, along with his band-mates, became an ambassador for Rays of Sunshine, an organisation whose goal is to "brighten up the lives of seriously ill children aged 3 to 18 by granting wishes and organising large scale events." Throughout the years, Louis and One Direction have regularly given their time to Rays of Sunshine, granting wishes for children all across the United Kingdom. In October 2012, One Direction hosted a rooftop event, and in December 2013, they held a private concert event for some of the children Rays of Sunshine sponsors. In June 2014, December 2014, and September 2015, One Direction partnered with Rays of Sunshine and hosted events where the children could ask questions and get their photo taken with the boys with over 100 wishes being granted. Louis Tomlinson in Ghana for Comic Relief (2013). One Direction have been long-time supporters of Comic Relief, a UK based charity "with a vision of a just world, free of poverty." They aim to raise awareness and tackle poverty and injustice, and they do so through two major campaigns: Sports Relief and Red Nose Day. In 2013, One Direction partnered with Comic Relief for Red Nose Day with Louis and his band-mates travelling to Ghana and visiting the Agbogbloshie Township. While there, One Direction joined students at a local school, even playing a game of football with some of the children they met. The boys also visited Princess Marie Louise Children's Hospital in Accra, an emotional experience that left indelible images of the struggles faced by the brave people in this community. When asked about it, Louis said, "Seeing these sick children puts everything in perspective." The eye-opening experience inspired Louis and the other boys of One Direction to do all they could to help and further raise money for Comic Relief. Continuing their support of Comic Relief, One Direction also recorded a cover of Blondie's One Way or Another and The Undertone's Teenage Kicks, titled One Way or Another (Teenage Kicks). They released the single on February 17, 2013 with proceeds and royalties from the single going directly to Comic Relief. The boys also shot the music video for the single themselves, donating the money they would normally have spent on production to the charity. Performing live at the Red Nose Day telethon, Louis sported a new red hair-style, further supporting the charity and encouraging those watching to donate. Louis and One Direction ultimately helped raise over two million pounds for Comic Relief. While the work Louis did within One Direction and with his band-mates was phenomenal, Louis has also branched out to be involved in charities on his own. He has given even more of his time and his money to additional charities, some even without the public's knowledge, further displaying just how large and golden his heart truly is. 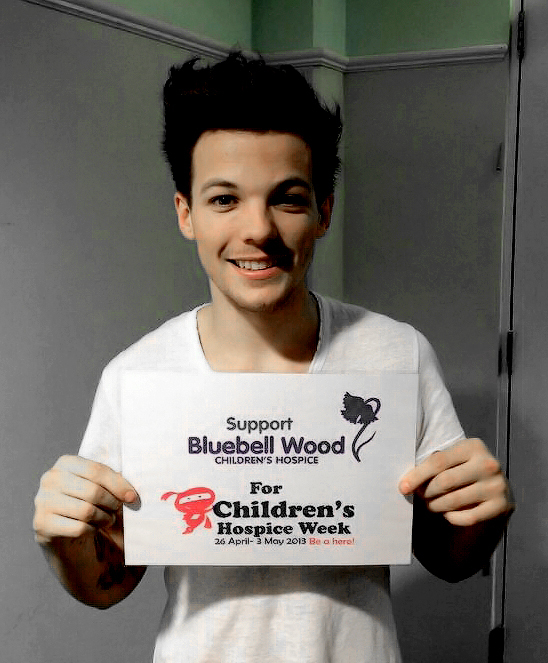 Louis Tomlinson for Bluebell Wood Children's Hospice (2013). In 2012, Louis became a patron for Bluebell Wood Children's Hospice based near Louis' home town of Doncaster, a place that offers care and support to children with a shortened life expectancy and their families. The proximity meant that Louis often stopped in to visit the children staying at the hospice, usually without any public knowledge of these visits and expecting nothing in return. At one of these visits, Louis spent over two hours chatting with the children and their families. In October 2012, Louis helped organize a charity football match between the Doncaster Rovers and Louis' team for the match, Three Horseshoes. Louis helped his team to a 3-0 win, and the money raised through the match's ticket sales went to Bluebell Wood. It would not be the last match for Louis in support of the charity. In April of 2015, Louis partnered with former Rover James Coppinger for another match. While this time, Team Louis lost 7-4 to Team Coppinger, more vital funds were raised for Bluebell Wood through ticket sales. Louis Tomlinson with Eden Goldman. In 2014, Louis met Eden Goldman and her family and quickly became a patron for the Eden Dora Trust, a charity aimed to "raise desperately needed funds to provide training for adults working with children affected by Encephalitis and Acquired Brain Injury (ABI), to fund research into Childhood Encephalitis, and to help families and carers when they need it most." Since Louis joined the trust, he has made sure to be there to support Eden, who suffers from ABI following Encephalitis, making regular visits to the family's home to spend time with her. Louis has also invited Eden to One Direction concerts, and Eden attended Louis' charity football match in 2015. On October 30, 2015, Louis partnered with the Eden Dora Trust to host a tea-party. Fans were treated to afternoon tea, pastries, and a photo-op with Louis, and all the funds from the tickets went to the trust. It's safe to say that Louis has a soft spot for children when it comes to charity, and he is always making an effort to reach out and help in any way that he can. From Niamh's Next Step which supports children with Neuroblastoma, an aggressive form of cancer, to Stacey's Smiles which grants wishes and organizes special treats for Neurobastoma children, Louis has donated both time and money. And for one little boy named Harvey, Louis made sure to go the extra mile, treating him and his family to a holiday before inviting them to a One Direction show. Louis made sure everything was arranged from hotel to car, and he even gifted Harvey his microphone. Louis Tomlinson for Soccer Aid (2016). In 2016, Louis once again used his football talent to help raise awareness and funds for charity by participating in Soccer Aid, which brings together celebrities and professional footballers from the United Kingdom and the world to play a match to raise money for Unicef UK. Louis played for Team England while bandmate Niall Horan played for The Rest of the World. Despite Louis not having a lot of playing time on the pitch, Team England clinched a victory, and Louis and the rest of the participants were able to raise 6.6 million pounds for Unicef UK. Louis' most recent charitable act came just this past month. On June 14, 2017, Grenfell Tower in London caught fire, destroying the building and taking the lives of an approximated eighty people. Louis, along with fifty other artists, including band-mate Liam Payne, recorded a cover of Simon and Garfunkel's Bridge Over Troubled Water, with Proceeds from the charity single going to support the victims of this terrible tragedy. Charity and giving back is clearly something very near and dear to Louis Tomlinson's heart. He's always willing to do everything he can to put a smile on a child's face and is more than happy to give both time and money in support. Louis heart is golden, and how it fits in his chest, we may never know. But one thing is for sure: his affinity for charity is a beautiful sight to behold. Footnote: Whist we acknowledge that Louis has a long association with the Believe in Magic charity, including the Cinderella Ball, due to the ongoing investigation by the Charity Commission For England and Wales, we have chosen to not include them in this article.